Basic Facts of a Radiant Barrier | Bert Roofing Inc.
What is radiant barrier and do you need it? What is TechShield? Does Bert Roofing install these products? He is our frequently asked questions on this and related topics. On a warm summer day, say around 95 degrees, your attic may be pushing 150 degrees. It is hot in there, really really hot. So why is it so much hotter than the 95-degree temperature outside? You home absorbs energy radiating from the sun, the same energy the powers a solar panel. Unlike a solar panel that converts that energy into electricity, that energy becomes heat in your attic. A radiant barrier is a layer of material generally on the underside of your roof deck that acts as a shield to the radiant energy literally letting solar energy bounce off your rooftop and back into the atmosphere. TechShield is sheathing manufacture by Louisiana Pacific (LP) that has a layer of aluminum laminated onto one side creating a radiant barrier. 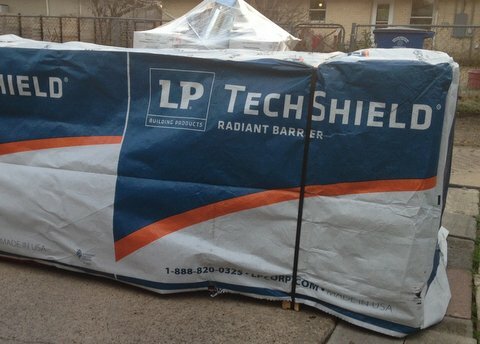 Per LP, TechShield is original and leading radiant barrier sheathing. Installation is no different than a typical four by eight sheets of decking. For the consumer, this is great because the upgrade cost to radiant barrier decking is mostly material only and not a great expense. How much can I save with a radiant barrier? With so many variables such as the amount of insulation and the price of electricity, it would be a big guess for any roofing contractor to put a dollar figure on this (LP puts a figure of up to 17%). We can tell you it will definitely lower the temperature of your attic during the summer months. Per LP, summertime temperatures can be up to 30 degrees cooler by blocking up to 97% of the radiant energy. Are there other radiant barrier products besides sheathing? Yes. Radiant Barrier can be added to the underside of an existing roof deck as a rolled aluminum product which is generally stapled on. There is also radiant barrier paint products that can be sprayed on the underside of a roof deck. The main problem with these retrofit methods is access. These are next to impossible to install on a low sloped roof and can be a challenge even in attics that have room to move around in. How common is it to replace sheathing/decking when replacing a roof? Once upon a time Dallas, Richardson, Plano and many other communities had scores of wood shingle roofs. All these wood shingles eventually get removed and new decking gets installed before new shingles are installed. Today, there are few homes with these legacy wood shingles. Wholesale installation of new decks is not common. It can be an expensive proposition to replace all the decking for the sole purpose of adding new decking with radiant barrier. Some properties that use cheap 3/8 inch decking could use a new roof deck. Hoses that have a vaulted ceiling and no attic can benefit from upgrading decking. One property we replaced the decking on only the West side that most exposed to the summer afternoon heat. SolarBord is a radiant barrier sheathing manufactured by Norbord. It is a direct competitor to TechShield but does not have the same name recognition as the LP product. There is little reason to have a preference between TechShield and SolarBord. Sheathing with radiant barrier is often considered a commodity by the wholesalers and they will seldom have both products in stock at the same time. They buy whichever is cheaper and that constantly changes. There have been times we had a contract that called for TechShield and only SolarBord was found anywhere in town. The opposite can be true as well. Consequently, when installing decking with radiant barrier we will use generic language so either product may be used on a project. If you want a specific name brand be very clear on this point as sometimes the more common TechShield is thought of as simply radiant barrier and not a specific brand (Much like Kleenex is used is a substitute for tissue paper). No. Radiant barrier and insulation are different animals. Insulation prevents the transfer of heat from one space to the next. Insulation helps keep your home a constant temperature regardless of the outside temperature. Radiant barrier keeps your house from absorbing solar energy and being hotter in the summer. Radiant barrier is much more important in parts of the country where cooling cost is the main issue. Our official answer is to check your local codes and ordinances, but for the most part, it is not mandatory. It is, however, a good thing and in most cases will pay for itself easily. If you need an estimate on roofing and/or radiant barrier products, please call us at 214-321-9341 or fill out our online form. We have Techshield Radiant Barrier Overlay. We had a new roof the end of March. We did not go up to our attic until a few weeks ago to get some boxes. At that time we noticed that the nails had penetrated through the Techshield. We called the company that put the roof on and told them the nails have penetrated the Techshield. Th Project Manager is coming out to look at it but he said that the nails penetrating the Techshield have nothing to do with keeping the heat out. Could you please let me know if that is true. Also, we never could get a signal on our cell phone and now we can. Roofing nails are made to penetrate the wood deck they are attached to. You would need to get an engineer to give you a proper answer, but I would think the nails would have so little impact of the function of the radiant barrier that it could not even be measured by most household thermometers.